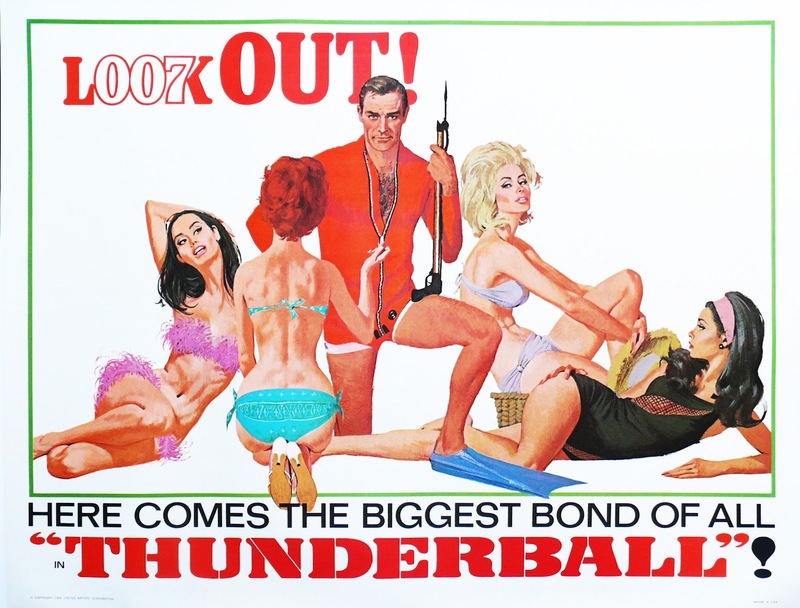 This essay on Thunderball is the 4th in a 24-part series about the James Bond cinemas. I encourage everyone to comment and join in on an extended conversation about not only the films themselves, but cinematic trends, political and other external influences on the series’ tone and direction. Contrary to popular belief, George Lucas didn’t invent the blockbuster event movie; Star Wars merely renewed (perhaps perfected) the novelty of movies as the grand spectacle. Griffith, not a humble man by any means, anticipated this success. He used all of this newly available cash to fund the already-in-production Intolerance, a film that would serve both as a personal response to the critical backlash against Birth’s questionable racial content and as spectacle to eclipse the broad scope of his prior efforts. While Intolerance drew large crowds, the film, ultimately, could never hope to recoup the money put into the production and subsequent road show that accompanied the film upon release. As a direct result his private film partnership dissolved 1917. In 1919 he founded United Artists (coincidentally, the studio that would eventually back the Saltzman/Broccoli production of Dr. No, thereby launching the Bond franchise) with Charlie Chaplin, Mary Pickford and Douglas Fairbanks. He would never again achieve widespread commercial success and by 1924 he was forced to leave United Artists after a series of box office failures. Potential James Bond pub trivia: Which James Bond film has the highest box office take, factoring in adjustments for inflation? Think about it for a moment. The answer is Skyfall. The latest James Bond film, buoyed largely by a huge critical reception, managed to surpass all other entries in the 23-film James Bond series. But just barely. 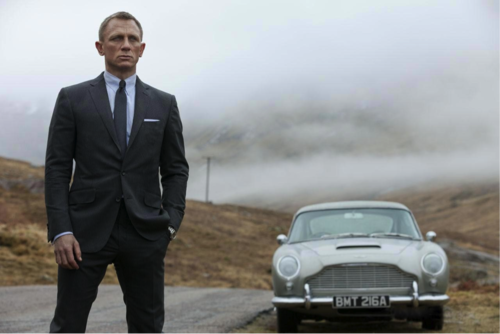 Which film did it narrowly eclipse as the highest grossing Bond adventure? Now I’m going to throw some numbers out for you. Goldfinger grossed $124.90 million at the box office. Thunderball: $141.20 million. Goldfinger’s budget checked in at $3 million. Thunderball: $6.8. With great success comes great expectation. The budget of Thunderball more than doubled that of Goldfinger to meet the demands of thrill-seeking moviegoers expecting the Bond franchise to continually reinvent spectacle. Dr. No and From Russia with Love (Jamaica and Istanbul, the Orient Express) kept budgets low by employing exotic locales as spectacle. Goldfinger introduced many of the Bond tropes we’ve come to expect: gadgets, automobile fetishizing, layers of womanizing and over-the-top villains and henchmen. It is, in a way, the prototype for every James Bond film that would follow for decades after. Thunderball, however, took advantage of Goldfinger’s popularity to be bold—just as D.W. Griffith took advantage of A Birth of a Nation’s swelling coffers to create the largest movie the moviegoers of 1917 had ever seen. In Thunderball, after Bond escapes his pre-credit predicament on a jetpack, Director Terence Young sends 007 down to swim with the fishes and a former Miss France, Claudine Auger, who must not be omitted when discussing spectacle because she’s clearly not chosen for her acting prowess – her lines were all dubbed due to her accent. At this point in cinema history, it was what lied beneath the oceans that had begun to captivate audiences. Space had yet to officially become “the final frontier” and science fiction and alien encounters were little more than B-movie fodder, certainly not the topic for mainstream cinema. Jacque Cousteau’s international fame had been growing for a decade and 1966, the year after the release of Thunderball, saw the premiere of The Undersea Life of Jacque Cousteau (and Star Trek the television series, which wasn’t particularly well-received at the time). The technology for filming underwater had just been perfected, thus allowing a movie to finally, legitimately, be filmed underwater rather than using light effects to simulate undersea conditions. Since they finally could, they did. Contained within Thunderball’s 130 minutes viewers witness undersea airplane wreck navigation, undersea shuttling of nuclear weapons, undersea shark encounters, undersea (and idle) snorkeling with Claudine Auger and finally an undersea battle royale with spear guns and knife fights. Director Terence Young required four different film units to complete production (the first unit films key face-to-face dialogue, subsequent units generally shoot action sequences using stunt personnel or scenes requiring different setups). Thunderball doesn’t merely contain a few scenes of underwater intrigue. One quarter of the entire film takes place underwater. The camera lingers, its goggled gaze obsessing over intricacies of balletic evil-doer plotting that would normally have been dispensed in one or two lines of dialogue. From a certain perspective (one without the crippling production cost and subsequent dissolution of the production company), Thunderball is the James Bond franchise’s Intolerance. Critics of the film called it “bloated” and “monotonous” citing the repetitive aquatic action. While reasonable observations, these criticisms are lobbied out of context. Spectacle films, as Thunderball should be considered, must go beyond the anticipated, or the normal. The “Dean of Special Effects” John Stearns, Bond special effects supervisor through the first eight films (and eventually the creator of the lightsaber and many other primary visual effects in Star Wars), received an Oscar for his work on Thunderball. To date, this remains the only Academy Award given to any James Bond movie, justifying, perhaps, the abuse of the new technology. To modern audiences, it may seem like the “boring Bond,” but box office response proved overwhelming. When it isn’t bogged down by the its obsession with underwater photography, Thunderball is an essential Bond movie at heart. It boasts some elaborate and thrilling sequences, excellent cinematography and a lively score by John Barry, especially during the underwater action scenes. Today, we find it easy to watch Thunderball and laugh away the many prolonged and indeed monotonous scenes of underwater machinations. We see nothing particularly special about underwater photography. But consider the time. Consider how remarkable it would have been to witness an underwater encounter with a real live shark as Sean Connery is forced to do in Thunderball. Even today we watch our televisions for one week per year to do this very same activity during Discovery Channel’s Shark Week (minus Sean Connery). The novelty hasn’t worn off. It’s just diluted behind layers of cynicism and eyes jaded by digital effects limited only by imagination. And quite often, limitless imagination does not produce inspiring results. Watch the following clip from Intolerance. How easy is it to watch this and think nothing of the scope and scale required to create this scene, merely because it is silent and cropped within a narrow 4-by-3 frame? How easy is it to see right through the scores of extras? The elaborate sets? The orchestration of so much activity? All too easy.